Reinforcement materials are essential for the formation of fiber-based composites. Composites are multi-phase materials, are made from two or more constituent materials with significantly different physical or chemical characteristics that, when combined, produce a material with properties different from the individual components. Reinforcement materials are essential to provide rigidity and structural strength to the composites. Factors such as urbanization, growing number of construction & rise in number of automotive industries in are expected to boost the growth of the Vietnam reinforcement materials market during the forecast period. In addition, technological development, lower cost of products, and growing industrialization are fuel the market growth in Vietnam. The Vietnam reinforcement materials market is segmented based on material type and end user. Based on material type, the market is bifurcated as glass fiber, carbon fiber and others. Glass fiber market further sub segmented as roving, woven roving, fabrics, CSM/CFM, chopped strand, and others. Carbon fiber market is further sub categorized into woven fabric, thermoset UD prepreg, thermoset fabric prepreg, thermoplastic prepreg, raw fiber, and molding compounds. Based on end user, the market is categorized as construction and others. Construction further sub classified as residential, infrastructure and industrial. At present, the glass fiber segment contributes for the highest market share among all materials, and is anticipated to continue to remain dominant during the forecast period. Glass fibers are readily produced from raw materials, which are available in virtually unlimited supply. Glass fibers are used in the manufacture of structural composites, printed circuit boards, and a wide range of special-purpose products. Glass fibers preferably used for reinforcement due to some factors such as lower cost, stability, and inertness, as well as desirable fiber properties such as strength, flexibility, and stiffness. Increase in construction sector, growing urbanization, developing automotive industry, increasing foreign direct investment and developing economic condition are expected to drive the market growth of glass fibers in Vietnam. Even with these opportunities the Vietnam glass fiber market is challenging due to increasing costs in energy and transportation through sea freight. On the other side, carbon fiber segment is anticipated to exhibit the fastest growth rate during the forecast period. Carbon fibers have been researched and used intensively because they have excellent tensile properties, low densities, and high thermal & chemical stabilities in the absence of oxidizing agents, coupled with good thermal and electrical conductivities. The range of their applications would depend on the type of precursors used to produce the carbon fibers. Over the past decade, there have been a number of changes in the application areas for carbon fiber. Aerospace & defense applications have grown significantly and are now the largest consumers of carbon fiber. industrial. It is estimated that, construction segment will show fastest market growth in Vietnam owning to rapid increase in industrialization and urbanization, resulting in rising need for more housing and commercial buildings. In addition, growing number of foreign direct investment, lower cost of products and lower labor cost further drive the market growth in Vietnam. 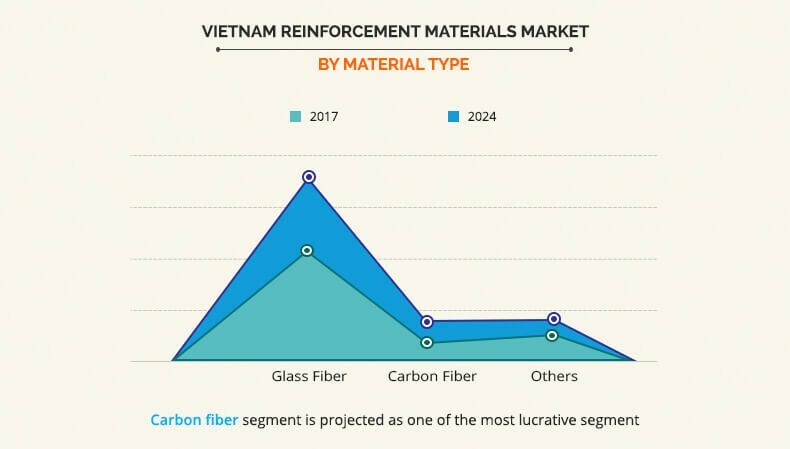 Vietnam reinforcement materials market is dominated by medium and large-scale manufacturers such as Vietnam Steel Corporation, vibuma, Central Glass Co., Ltd., Lanxess AG, International Standards Trading Vietnam Co. ltd., Posco SS-Vina, Co. Ltd., and QH Plus Corporation. 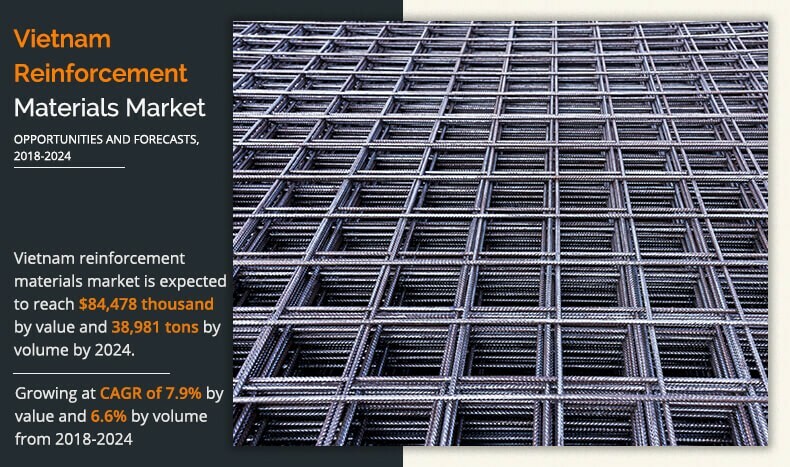 This report provides an extensive analysis of the current trends and forecasts estimations and dynamics in the reinforcement materials industry in Vietnam. Comprehensive analysis of factors that drive and restrain the growth of the Vietnam reinforcement materials market share is provided in the report. 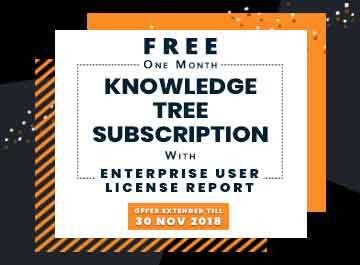 It offers a quantitative analysis from 2017 to 2024, which is expected to enable the stakeholders to capitalize on prevailing market opportunities. Reinforcement materials are essential for the formation of fiber-based composites to provide rigidity and structural strength. Composites are multi-phase materials, prepared from the amalgamation of two or more components that differ in properties. Sustainability and structural strength of reinforcement materials has made it ideal for use in automotive, consumer goods, marine products, and construction among other markets. Growing population, urbanization, growing number of construction & rise in automotive industries in Vietnam are drive market growth over the forecast period. In addition, technological development in production of reinforcement materials, lower cost of products, and growing foreign direct investment are fueling the market growth in Vietnam.